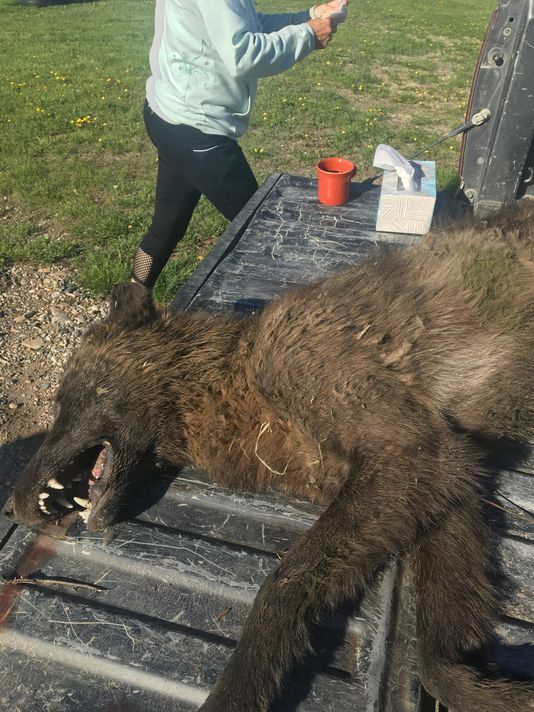 From the Great Falls Tribune: Was it a wolf, some type of hybrid, or a creature that hasn’t been seen in Montana since the Ice Age? On May 16 a lone wolf-like animal was shot and killed on a ranch outside Denton. With long grayish fur, a large head and an extended snout, the animal shared many of the same characteristics as a wolf; but its ears were too large, its legs and body too short, its fur uncharacteristic of that common to a wolf. The locals are buzzing about the possibilities. Some think it’s a wolf with weird genetics…others say grizzly cub…or a Dire Wolf, an extinct prehistoric carnivore that some people swear still lives…or even a Dogman, a relative to Sasquatch, a large cryptozoological creature that looks and walks like an upright canid. The strange creature’s carcass was sent to the U.S. Fish & Wildlife Services forensics lab in Oregon. “We have no idea what this was until we get a DNA report back,” said a spokesman for Montana Fish, Wildlife and Parks. It could take weeks or months to find out. This entry was posted in Big Bucks, BigDeer, Deer Hunting, Predators by admin. Bookmark the permalink.